A Nation of Nations | American University Washington D.C. 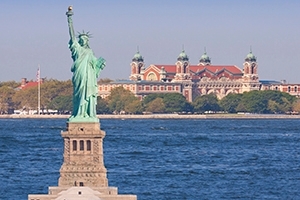 The Statue of Liberty and Ellis Island still conjure up images of the nation's immigrant history. At the outset of Donald Trump's bizarre but surprisingly robust presidential campaign, he went directly after the issue of Mexicans coming across the border: "They're bringing drugs. They're bringing crime. They're rapists." In the aftermath of this fiery speech, corporate sponsors and business partners rushed to disassociate themselves from the political gadfly. Despite the ensuing controversy, Trump's poll numbers soared. He climbed to the top of the Republican presidential field, and he has dominated the GOP campaign discussion ever since. Why did the anti-immigration rhetoric that horrified many people also resonate with disillusioned voters? In recent interviews, several American University professors discussed why immigration has proved so politically divisive. Beyond a polarized electorate, it's due to the nation's deeply conflicted feelings about immigration. "It's been a difficult reality for mainstream Americans to accept the fact that so much of our economy is dependent on largely Latino immigrant labor, and many of the workers are undocumented," says Angie Chuang, a School of Communication associate professor. This contradiction—that the U.S. relies on migrant labor without explicitly endorsing it—is reflected in Trump's own business operations. Chuang points out that Trump's company is using undocumented construction workers in D.C. "I find it remarkable that he could say the things he's saying about immigration, and get away with that. And I think the only reason why he gets away with it is because it's a known secret" that this is common practice, she says. Alan Kraut, a history professor in the College of Arts and Sciences, says that Trump's immigration platform should be placed in the context of economic inequality and a dwindling middle class. "There's always a kind of love-hate relationship with immigration in the United States. People like Mr. Trump and others who have nativist perspectives are also echoing the economic insecurities and concerns that grew out of the recession," he says. "There's a great deal of anger and resentment in the heartland, and people like Donald Trump tap into that without a whole lot of effort." Panic over illegal immigration is often attributed to racism and xenophobia, spurred by current population trends. A recent Pew Research Center report detailed how immigration has dramatically altered the nation's demographic composition, and that non-Hispanic whites are projected to lose their majority status by 2055. All of the AU professors interviewed for this story believe that this is partly driving anti-immigration sentiment. Matthew Wright, a School of Public Affairs assistant professor, doesn't deny that there is native-born resentment over this demographic shift. But based on his research, Wright believes the issue is a bit more complicated. Americans' perceptions of immigrants are heavily shaped by questions of legal status. "It's always true that if you seem to be a more prejudiced person, you're going to be more hostile to immigrants, regardless of whether they're legal or illegal. But illegal immigrants face substantially more hostility than could just be attributed to prejudice," he says. As part of one study, Wright and his colleagues probed attitudes about legal and illegal immigrants from the same country of origin, and respondents showed much more hostility towards undocumented immigrants. "In our argument, it was more about the sense people had that there were rule violations going on," he says. Ernesto Castañeda, an assistant professor in the Sociology Department, has interviewed many immigrants in the United States and Europe. And despite some anti-immigration rhetoric on the campaign trail this season, Castañeda believes that the U.S. has effectively integrated its newcomers. As part of a project that he's currently turning into a book, Castañeda compared the immigrant experiences of Mexicans in New York City and Algerians in Paris. In France, he says, people are forced to integrate too quickly, without the ability to celebrate their heritage and culture. "There are very few religious associations, and very few community groups for immigrants. They may be told they're French, but they don't feel French," he says. Yet Mexican immigrants in New York get acclimated more gradually and maintain dual identities. "This is better for the immigrants' mental health and physical health," Castañeda explains. And this also makes them start to feel more American, he adds. "Even with Trump's popularity and this anti-immigration public discourse, in my experience, immigrants find most Americans pretty open to them as individuals," he says. "It's not so much what Trump says. It's what the citizen says to them in the park, in the subway, or in the restaurant." In this GOP presidential primary season, Trump and other Republican candidates are vying for conservative voters who often oppose pathways to citizenship and favor tighter border controls. Yet this could become problematic for Republicans in the general election. As late as 2004, George W. Bush took 44 percent of the Hispanic vote, but Republican nominee Mitt Romney got just 27 percent of those voters in 2012. "I do think the Latino vote is going to be central to this general election," says School of Communication assistant professor Carolyn Brown. "Right now, Latinos often vote on immigration." Brown feels that Trump's language will continue driving Latinos away from the GOP. "Taking a hard line on immigration shuts the conversation down for most Latinos, whether they're immigrants or not," says Brown, a Latina documentary filmmaker. Since many U.S.-born Latinos have immigrant family members, any talk about deporting people is going to be met with substantial resistance, she adds. Despite how radioactive the immigration issue appears, the U.S. is often thought of as a nation of nations. We commemorate that immigrant past with great reverence at Ellis Island, once a beacon of hope for people seeking liberty and a better life. Yet Kraut, who chairs the Statue of Liberty-Ellis Island Historic Advisory Committee, explains how current anxieties over immigration are quite familiar. "This is not unlike what you saw at the turn of the 20th Century. Then you had many people of White Anglo-Saxon Protestant heritage, looking at all of these 'little grubby' Eastern European Jews and Southern Italians coming into the United States, and saying, 'My god, we're going to be overrun, and they'll change the culture,'" he says. "People say, 'My forebears were hard workers. These newcomers, they're not hard workers, and they don't want to learn English.' And you hear that trope repeated again and again and again." This month marked the 50th anniversary of the Immigration and Nationality Act, which replaced national origin quotas with hemispheric quotas. Provisions in the law, such as the family unification measure, opened up the borders to many non-European immigrants. Subsequent decades saw significant Latino growth, and more recently, an influx of Asian immigrants. Kraut says that many of these new migrants are well-educated scientists, engineers, and high-tech workers. AU experts believe immigration policy will be debated well after the 2016 election. Even if Democrats hold their political advantage with Latino voters, they'll still need to forge a consensus for comprehensive immigration reform. This has so far been elusive, with roughly 11 million undocumented immigrants in this country. Wright of SPA says even vociferous immigration opponents often stop short of supporting all-out deportation, lest they look like they're endorsing a police state. "You see this with Trump. Basically, he has no ideas for how to actually implement any of this," Wright says. "Are you going to round people up humanely? What does that mean?" SOC's Chuang adds that it's an issue with no easy solutions: "Even for people who would consider themselves pro-immigrant, there's no one way to address the current situation that both is compassionate and addresses the needs of everybody involved."